The Dottyback which is sometimes referred to as a marine Pseudochromis, are small brilliantly coloured reef fish which are very shy in the wild and are never found far from their favored cave. A common site in any reef aquarium, Dottybackss come from coral reefs all over the world. There are about 100 different species, broken into 4 sub-families. There are many rare dottyback found in remote locations throughout the world. Depending on where you live they can be quite expensive. In marine aquariums Dottybacks will start out being very shy but can warm to you with time. They are always darting to and from their favorite cave while still trying to keep a keen eye on what ever you maybe doing in the room. In the aquarium it is important to offer marine dottybacks a varied diet of high quality frozen foods as over time they tend to become dull in color, which can be very disappointing. Frozen plankton, brine shrimp, mysis shrimp, and bloodworms are all good selections to feed. Identification: The Bicolor Dottyback also called the Bicolor Pseudochromis is native to the tropical reefs of the Central Indo-Pacific. As one of the hardiest and undemanding reef fish available, the Bicolor Dottyback is an excellent choice for beginners as well as the more experienced hobbyists. 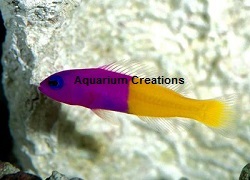 The Bicolor Dottyback has clear fins and has a beautiful color combination of a front half that is solid, bright-purple to hot-pink and a rear half that is a vivid, bright-yellow; which is how it got its name. There are no special markings, although some specimens exhibit a very thin vertical line where their dual coloration merges in the middle; the color of the line is exactly what you would expect to see from mixing the other two colors. Tank Recommendations: Dottybacks require an aquarium of at least 30 gallons and with a rock-associated lifestyle should be provided with plenty of live rock and hiding places. They are middle to bottom dwellers that generally mix well with other reef inhabitants, but are territorial and can become aggressive towards other Dottybacks or similar-shaped fish. 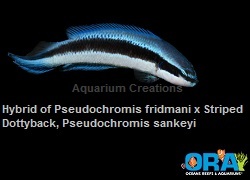 Food and diet: Dottybacks are carnivorous and naturally prey upon small shrimp, amphipods, copepods and bristleworms. In the aquarium they should be fed a variety of meaty foods such as live, frozen, freeze-dried, and vitamin enriched brine shrimp, finely chopped mysis shrimp, finely chopped krill and other sea foods; as well as carnivore/omnivore pellets and flake foods. To preserve the stunning coloration of a Dottyback, variety and vitamins are very important (their beautiful color may fade without them). Feed 1 to 2 times per day. 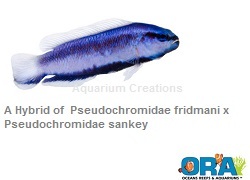 Approximate Purchase Size: 1-1/4" to 2"
Identification: .The Captive Bred Orchid Dottyback, Pseudomchromis Fridmani is quite peaceful as dottybacks go. It can even be kept in mated pairs and small groups. However, I wouldn't suggest this unless your tank is fairly large with liverock to provide a lot of different territories to choose from. The perfect fish for a reef system, you won't run into any problems there. This species is an ideal reef candidate, being totally inoffensive toward corals and other sessile invertebrates and posing a threat to none but the tiniest motile invertebrates. The Orchid Dottyback will work for its master by preying on pests such as small mantis shrimp and bristleworms. If more than one Dottyback will be maintained together in the aquarium, it is important to add them at the same time. Tank Recommendations: Minimum housing for P. fridmani is a tank in the ballpark of 20 to 30 gallons, and the aquascaping should consist of rockwork with lots of hidey holes to retreat into. Also, all dottybacks are good jumpers, so make sure the top of the tank is covered. 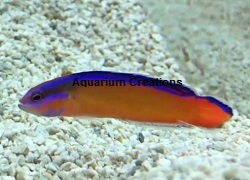 Approximate Purchase Size: 1-1/4" to 2-1/2"
Identification: Neon dottybacks are a beautiful orange color with neon blue stripes on the dorsal fin, gill cover and tail. P. aldabraensis prefer rocky shelter and live alone or in pairs in caves and crevices. In the wild it is found in colonies near vertical walls or ledges, where they dart out to grab a meal from the passing zooplankton, then rush back.The captive bred Neon dottybacks variety is quite easy to keep and feed and will make a great fish for both the beginner or the advanced saltwater aquarist. An excellent additional benefit to the Neon dottyback is that they prey on reef aquarium pests such as small mantis shrimp and bristleworms. Tank Recommendations: A 30 gallon or larger aquarium is the correct size. Using live rock provide ample hiding places, caves, crevices for these fish to go within, seek as home, or use as a hiding place when nescessary. Just like other dottybacks, keep the quantity to one unless the aquarium is large enough to handle more. Identification: The Indigo Dottyback is a hybrid of two red sea dottybacks, the Orchid Dottyback (Pseudochromis fridmani) and the Striped Dottyback (Pseudochromis sankeyi). 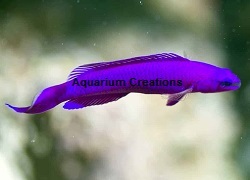 The result is a new beautiful hybrid called the Indigo Dottyback named for its incredible Indigo Blue coloration. The unique indigo coloration and the accenting graphic stripe add distinction to this wonderful captive-bred hybrid. An excellent choice in our aquacultured and captive-bred aquatic life. The Indigo Dottyback has the mild and social nature of the Striped Dottyback and unlike many other Dottyback, it can be kept in groups without concern. An excellent additional benefit to the Hybrid Indigo Dottyback is that they prey on reef aquarium pests such as small mantis shrimp and bristleworms. Tank Recommendations: A 30 gallon or larger aquarium is the correct size. Using live rock provide ample hiding places, caves, crevices for these fish to go within, seek as home, or use as a hiding place when necessary. Just like other dottybacks, keep the quantity to one unless the aquarium is large enough to handle more. Identification: This dottyback's predecessors sport two color schemes while the electric sports three. It has a black band running down the center of its body, it is a much bolder stripe than that of the Indigo Dottyback. Also the bottom portion of the fish is a very crisp white color. Its best feature would have to be the light blue slightly turquoise coloration on top. 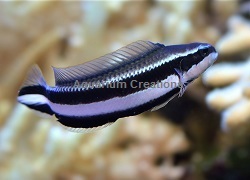 The Electric Indigo also has a beautiful caudal filament found in its Striped Dottyback lineage. Like other dottybacks the Electric Indigo Dottyback can change its color depending on this mood or comfort level. Once completely acclimated and settled in your aquarium they are just a fish to have. The Electric Indigo is also rather peaceful. An excellent choice in our aquacultured and captive-bred aquatic life. The Electric Indigo Dottyback has the mild and social nature of the Striped Dottyback and unlike many other Dottyback, it can be kept in groups without concern. An excellent additional benefit to the Hybrid Electric Indigo Dottyback is that they prey on reef aquarium pests such as small mantis shrimp and bristleworms. Identification: The Captive Bred Sankeyi Dottyback will reach a maximum size of around 3 inches. Its a very peaceful fish and shouldn't bother other fish, coral or inverts in your tank. For this reason the Sankeyi Dottyback makes a great addition to reef tanks. Sankeyi Dottybacks should not be kept with overly aggressive large fish, since they are not able to defend themselves. An excellent choice in our aquacultured and captive-bred aquatic life. The Sankeyi Dottyback has a mild and social nature unlike many other Dottyback, it can be kept in groups without concern. An excellent additional benefit to this Dottyback is that they prey on reef aquarium pests such as small mantis shrimp and bristleworms. Photos are representative of each species. All marine life will be unique and variations should be expected, color and sizes may vary. *Guarantee Restriction: All of our livestock are guaranteed. However for one or more of these species, they may be marked with a guarantee restriction. If it does, it means the specific animal may not handle stress from environmental conditions well. These stresses can include poor water quality, harassment from tank mates or confined aquarium conditions. When stressed, these species can lose the ability to ward off infection and disease. Other species may be listed as Restricted because they have such specialized feeding requirements that is difficult recreate in a aquarium and may succumb to malnutrition.